Melting snow, heavy rain and frozen ground have caused flooding in much of England, Scotland and Wales. There are no severe flood warnings in force in the UK. There are 21 flood warnings in England and two in Wales. In Scotland a landslide led to the closure of the A76 in Dumfries and Galloway, while a section of the M74 was shut. Both have since reopened. And in south Wales, properties in Maesteg, Bridgend, Ebbw Vale and Monmouth were also flooded. Mid and West Wales Fire service sent extra appliances to Carmarthen Bay Holiday Village at Kidwelly, where flooding was described as severe. 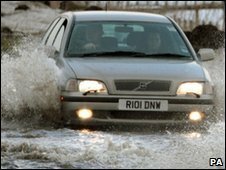 The Environment Agency has flood warnings in place for the Anglian, Midlands, North East, Southern, South West and Thames regions of England as well as the River Wye and Lower Dee Valley in Wales. The Scottish Environment Protection Agency has lifted its warning of flooding on the River Nith downstream of Auldgirth including Dumfries. Weather experts have said localised flooding was caused by a combination of factors. In a number of areas the ground remains frozen beneath the surface, which means excess water will run into rivers instead of being absorbed by the soil. The situation has been compounded by the rainfall, which was heaviest in eastern England and Scotland. Louise Lear of the BBC Weather Centre said Saturday had been grey and wet. Although conditions will improve there is still "wet weather to come" along the south coast of England, she added. These wet conditions would push "further south and east" and temperatures would fall to slightly above freezing - particularly in the far north and east of England, creating "icy stretches". Meanwhile, throughout central England the thaw after cold conditions have caused hundreds of water pipes to burst and leak. Severn Trent Water, which provides water to central England and parts of Wales, said it had drafted in extra staff as frozen pipes began to thaw. Fraser Pithie, the company's senior operations manager, said the firm had been called out to more than 470 bursts since Monday and call centre staff had taken more than 10,000 calls.